Follow Rob’s deep water bream fishing advice and you’ll enjoy plenty of netters like this..
“Although I’m a massive fan of fishing natural waters, Ulley Reservoir is fairly new to me.” I first saw a few match result posts on Facebook early last year, showing low double-figure bags of roach and the odd even bigger bag of bream. That looks like an ‘interesting’ water I thought to myself, and the rest is no history as I’ve now enjoyed quite a few open matches here. 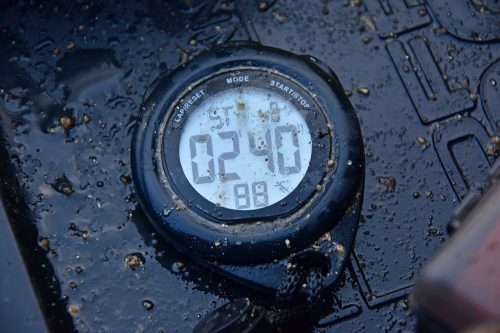 Being approximately 35-acres with average depths of 46-feet, it isn’t the easiest water I have ever wet a line in, but if you get it right and find the fish, the rewards can be prolific. I liken it to a mini version of Derbyshire’s Ladybower Reservoir. The fish you catch from Ulley you feel like you have earnt them, it is a really challenging water and that is what I find most appealing about the place. The main problem with Ulley like many big waters is the depth. Although you can fish a pole on most pegs, you are fishing between top five and top seven! The feeder line isn’t much easier either. I’ve fished matches where I’ve had a count of 23 to 24 using a one-ounce bomb. To say that it’s virtually bottomless in arts is an understatement! But as I say, when you are often landing 20lb-plus of roach or even bigger bags of bream, it makes for a highly interesting and unique day on the bank. When faced with such an expanse of water, many anglers turn tail and run as they have no idea where to start. 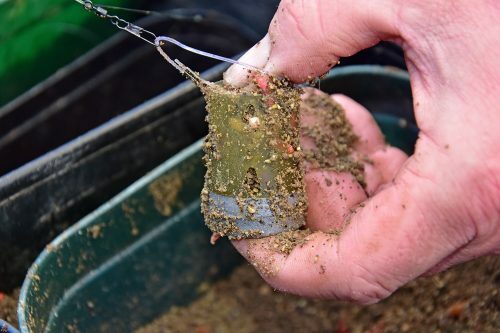 Mixing up any old groundbait before ‘pub chucking’ your feeder to the horizon might well see a fish or two ‘hang itself’, but it isn’t the best practice. Over the past few months I have come up with a simple two-pronged attack that has held me in good stead on these types of waters for years. Unlike many, who look to fish two feeder lines, I prefer to concentrate on just the one, with a pole line as a backup. As the feeder will be my main line of attack in a match, as I’m ideally looking to get into a large shoal of bream to quickly build my weight, the pole line is almost a throwaway. To this end, I tend to be very aggressive and positive on this line. On the feeder line, I will start the swim with eight feederfulls, but, when it comes to kick starting my pole line, I’ll ball in eight ‘baby’s heads’ of particle-laced groundbait, before leaving it to settle. I then time my casts on a stop watch, looking for a pattern to appear. At Ulley, I’ll leave the feeder out for a maximum of 10-minutes. Then, when I go onto the pole line later in the session, I know to only ‘have a look’ on the pole for 10-minutes. This means I have only missed one cast on the feeder line, so I’m better able to keep both lines going. Too many anglers, once they ‘come off’ a line, will wholly ignore it until they go back on it. This means you almost need to start all over again. If I catch nothing on the pole line, I simply revert back onto the feeder again. But, if I start to catch on the pole line, I take off my feeder’s hooklink and make three rapid casts, to keep the line alive, while I concentrate on the pole line for another 30-minutes or so. From here, I’ll see how things go. If I’m still catching, I repeat the ‘topping-up’ process on the feeder line, whilst staying on the pole. This tactic of keeping to line going is something that has worked very well for me on a number of waters and Ulley is no different. I have found more than once that you can get a late flurry of bream in the last 60-90 minutes of the match, but if you have totally neglected the line over the past few hours, they won’t stay as there is no bait to hold them. Being a big water, Ulley is mostly all about long casts. My set-up consists of a 12-foot Beastmaster DX 90g feeder rod paired with a large-spooled match reel. Regards the mainline, I go against the grain. Where most anglers like to use braid as it casts further, I much prefer 4lb mono with a 6lb shock leader. The reason being that braid is buoyant and in the deep depths of Ulley I was finding that it took too long for the line to settle, which meant I was often missing quick roach bites. Since the swap over to mono, although it still takes a while for the line to settle and tighten, it’s much faster than braid. The feeders I use are 40g weight-forward as they cast better over longer distances. I set them up using the traditional double-loop method as I find it gives you a better bolt effect. The hooklink – either 0.14mm or 0.12mm – is attached using a Cralusso quick change swivel. This means I can quickly swap from the 30-inch hooklink I start with to a shorter or longer one depending upon the bites. The hook is a size 14, which I tend to bait with double maggot, triple pinkie or a caster. What to put in the feeder? 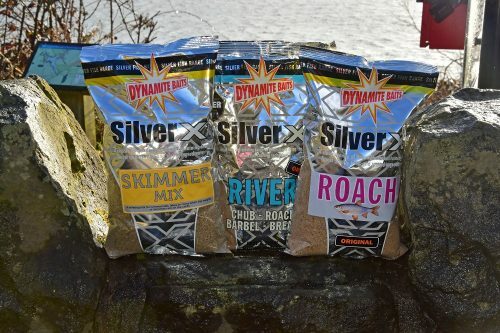 The all-important groundbait mix revolves around my favourite Dynamite Baits’ Silver-X Skimmer mix. 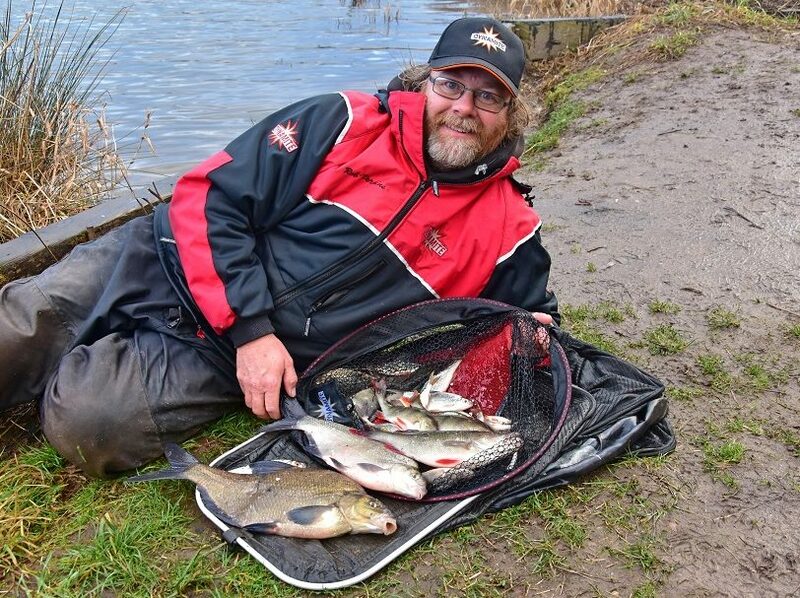 (Scroll down to see Rob’s top silverfish groundbait mixes video) It’s a mix I helped develop and although it is designed primarily to target skimmers, it is brilliant for caching bream and roach too. Being laced with fenugreek – as well as other potent additives and flavourings – this spice in particular is an extremely good appetite stimulant. I mix it on the dry side, adding around 40 per cent black damp leam. This adds two things to the mix. Firstly, it cuts down on the food value in the current cold-water conditions as well as creating a cloud in the water, something I think skimmers and bream like. When the water starts to warm, I gradually cut down on the amount of leam until I’m fishing pure groundbait. For the feeder mix, I add two-inches of crumb into a three-pint tub before mixing in a handful of casters and half-a-handful of pinkies. As it is still bitterly cold at the moment, I don’t need lots of particles to hold the fish in the swim. Again, as I’m after silverfish, I look to fish relatively long, today that means 13-meters. From the elastic down, I using either a Preston’s No8 Dura Hollow elastic through a top-two. But, if I’m looking to feed more chopped worm, targeting perch, “ill up this to a No9. The great thing about these elastics is they are heavy enough to strike through the deep water and also, they allow you to swing the smaller fish straight to hand. Float-wise I normally start with a3g to 4g model, depending upon the wind and tow. However, I have enjoyed days where a 1g float has done the damage. The mainline again is 0.14mm to a size 18, 0.10mm pre-tied Drennan Carbon Match hooks to nylon. The rig is shotted with a 2.5g ollivette with a sting of No10s below. The rig is then plumbed up so it is just touching bottom. 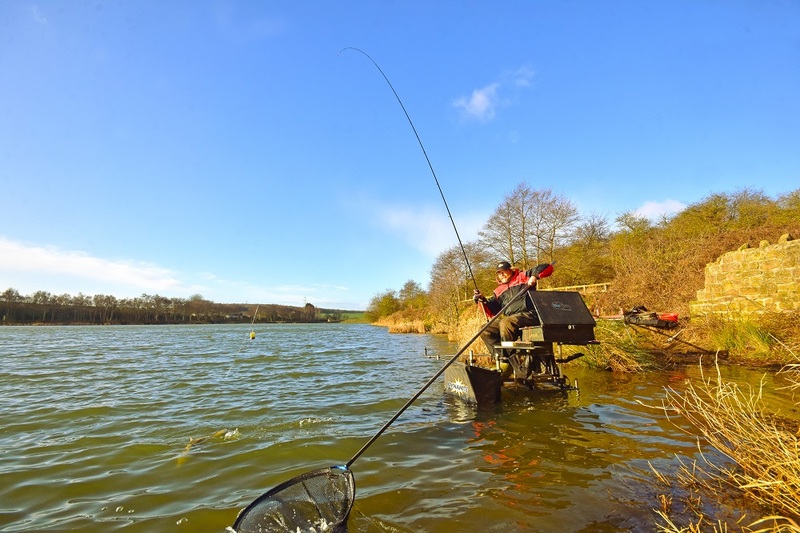 As Ulley is quite sloped in the margins, this means that if you fish past your mark, you are off bottom or well over depth if you fish a little short, Again, it gives you various options on the day. Rob likes Silver X Skimmer for feeder fishing and River and Roach on his pole line..
Hookbait are all variations of live bait – maggots, pinkies, casters or worm – whereas the groundbait is a mixture of one full bag of Dynamite Baits’ Silver-X Roach Original and half-a-bag of Silver-X River to add tackiness. 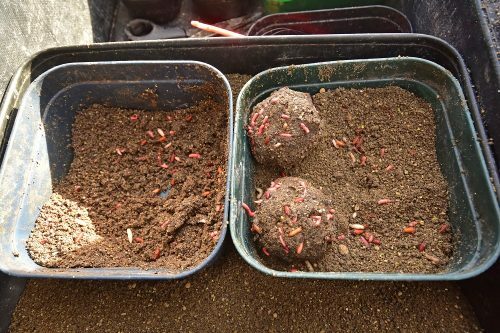 The groundbait is mixed with around 40 per cent molehill soil. Not only does this allow you to add more particles, but it helps the balls breakdown quickly on the reservoir bed, so that they down roll down the slope. baby head size balls of groundbait laced with freebies are what Rob preps his pole line with. BALL IT IN!! With both lines primed and baited, I always like to start on my first line – the feeder, whilst I give the pole line a good half-hr or more to settle. As I said earlier, my stop watch is possibly the most important piece of kit on the side tray today. Fishing in 10-minute bursts, allows me to keep both lines alive, hopefully lining the fish up. There is nothing worse than fishing one line to death or failing to loosefeed over it regularly. It is then a case of one, two; one, two. Looking on each line throughout the session, looking for a pattern to emerge. Even on hard waters like Ulley, the fish will prefer one type of presentation/baiting strategy. It is up to you to learn from what the fish are trying to tell you. 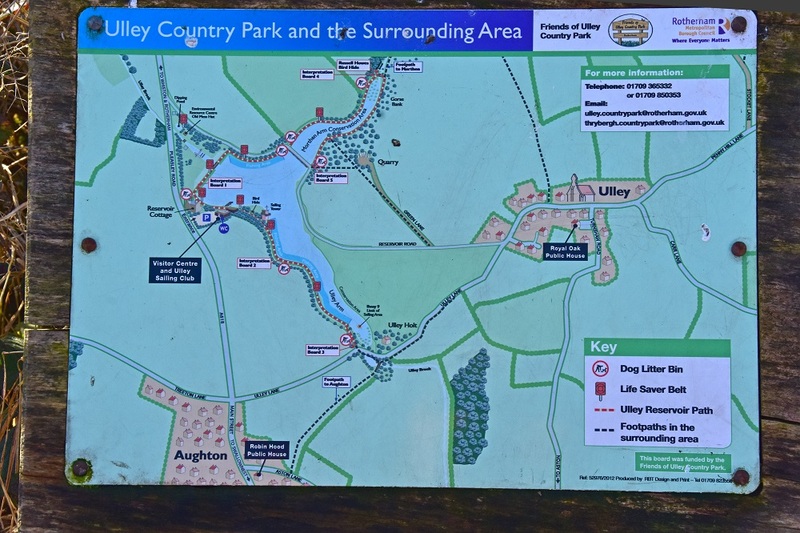 Although the fishing was relatively hard on the day I visited Ulley, it is easy to see the potential of the venue. And, although Ulley might not be the easiest venue in the world, I always prefer to earn my fish as it makes me appreciate them so much more.